The Dividend Paying Large Caps portfolio was up 2.3% (net of fees) in September as compared with the 2.97% gain for the benchmark S&P 500 Index (SXP). The portfolio underperformed against the market in September, due to the underperformance of Apple (NASDAQ: AAPL) down -2.42%, and Qualcomm (NASDAQ: QCOM) up slightly 0.85%. As of the end of September my portfolio was up 14.4% (net of fees) for the year, as compared to the S&P 500, which was up 19.7%. 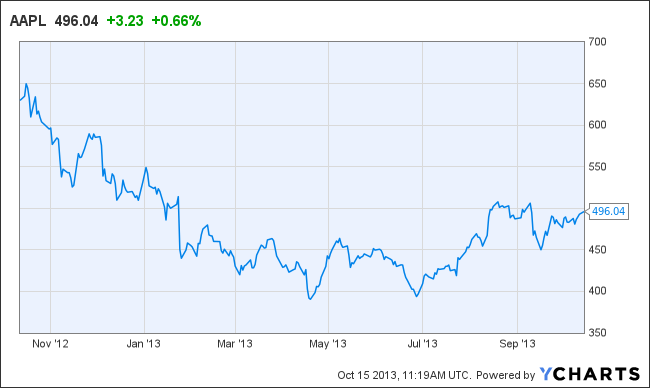 Since the largest position in my portfolio is Apple, my portfolio has suffered in 2013. Apple is down year to date over 13%. Thankfully, several other large positions on my portfolio, such as Wells Fargo (NYSE: WFC), have performed exceptionally well in 2013. To date, Wells Fargo is up around 18%. Though Apple stock is having a disastrous year, I anticipate that the stock will rebound in the coming months and as a result am not ready to give up any of my position at this time. In September, Apple launched the new iPhone 5C as well as the 5S and sold 9 million during the opening weekend. Apple also launched a streaming music service in September, which is completely integrated with Apple devices and iTunes. The product will compete directly with Pandora (P), Spotify, and Rdio. Since none of these companies produce gadgets that integrate their services, Apple has a clear advantage in my opinion. The Apple iTunes Radio is far from perfect, and to be honest many of the other similar services that have been available for some time are probably better (at least for now), but Apple has the economic resources to hire top talent and make this product work as well, if not better, than any of its competitors. I expect this service to be a big revenue producer for Apple in the coming years. Though I have no hard evidence to support this, my theory is that if the Apple TV is ever launched, it too could be a game changer in this industry. Qualcomm, the other holding of mine that has underperformed the S&P 500 in 2013, also has great potential to rebound in the future. In this analysis of Qualcomm stock, I expressed many of the reasons why I believe Qualcomm has a good upside. The company has no debt, pays dividend and has an interesting line of new technologies that are being introduced. The two most promising are Femtocells and Mirasol Displays. The stocks that continue to perform well in my portfolio are Wells Fargo (WFC), American Express (AXP) , and Aflac (AFL). All three of these stocks are from the financial/insurance sector, which is one of the two largest sectors in my portfolio next to technology. In September, I liquidated America Movil (AMOV) due to the small average trading volume of the stock over the past three months. This move was made to protect my portfolio from unexpected changes. I also increased my position in Qualcomm. Although the stock reached its 52 weeks high on September 20th, it is trading at the same price that was trading in March 2012. For the remainder of 2013, I'll be liquidating some of my positions and I will also be increasing my stake in some of the companies already in my portfolio that I believe have upside potential, the ones I'm looking at currently are Wells Fargo (WFC), JP Morgan Chase (JPM), and Aflac (AFC).